​ ​Creativity is widely acknowledged to be a key 21st century skill, and it is included in many countries’ lists of desired college and career-ready outcomes for students. 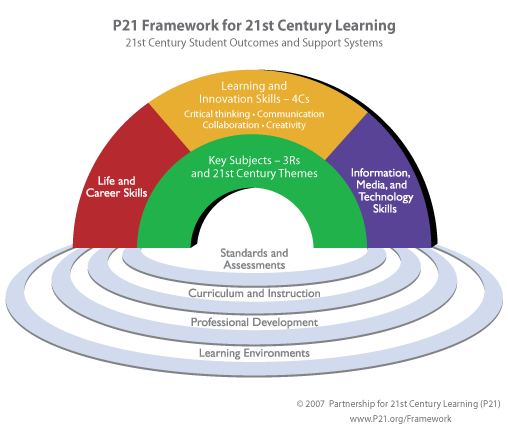 Creativity is included in the P21 Framework for 21st Century Learning as one of the Learning and Innovation Skills:(www.P21.org/Framework). Also known as the “4Cs,” they include creativity, critical thinking, collaboration, and communication. From creating works of art, producing abundant inexpensive water, developing non-invasive health devices or net zero energy homes, finding medical cures, restoring and improving urban infrastructure, generating new energy sources, and preventing nuclear terror, to developing sustainable ways to solve complex geopolitical problems, the ability to produce and implement new, useful ideas is rapidly becoming a critical attribute for leveraging knowledge success and increasing quality of life. Questioning old ways and Transliteracy way to change. 1) How does transliteracy change your current thoughts on the content you deliver? I had to understand the term first so I could understand what area of my program I would change. I found out that it's a new term coined in 2005 by the Transliteracies Research Project. The idea of having students in me classroom that are used to reading and writing on a electronic device and that my classroom has more options makes me feel empowered. When my advance students watch Youtube videos as a perclass front load assignment or when they compare and contrast two different Ceramics artist with Google docs and the internet for research, I understand that education has changed from a book and paper style learning and I’m glad. 2) How do you see the incorporation of transliteracy teaching methods increasing student inclusion and engagement? With the use of social media like twitter for critiquing whole classes artwork. Eportfolio’s for displaying all their artwork, artist statement, written assignments, blogs and general working note that is shared with the whole class, potential colleges galleries. I believe my students in my advanced classes will have a step ahead of other students in the artfield. My first year students will be filling out online documents and critiquing with social media for inclusion of all students. Developing their portfolios in which they may house all their classwork throughout high school career truly is engaging. This is only a small amount of the different lesson plans that included transliteracy. ​3) Your own thoughts... ​I do believe in the new face on education through this movement to change the way we read, write and think. It will take sometime for our schools and students to transition their thoughts about the way we’ll exchange knowledge for the future. Hopefully we will remove the idea of age being the marker we use to judge what should be learned. Students shouldn’t be limited to learn what government says they need to know, more what they need to know for the future of their career marker.